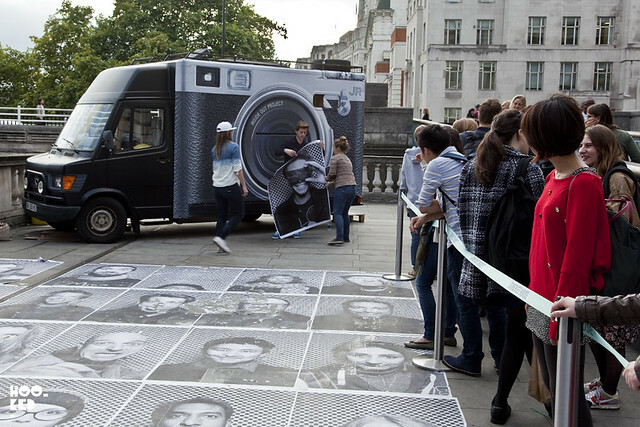 It's been five years since French artists and photographer, JR was last in London with a new collection of work. 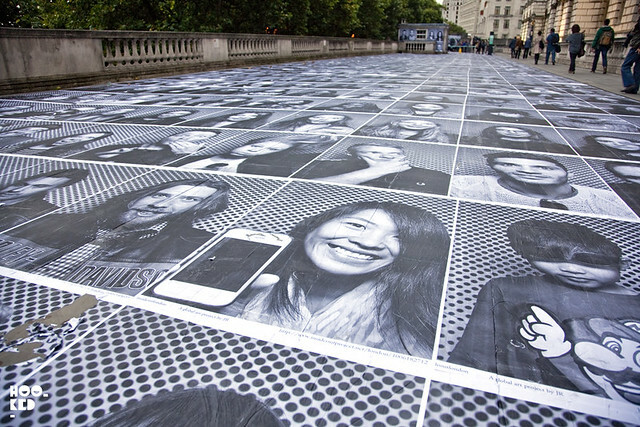 The artist has partnered up with London's Lazarides Gallery for a a two-part exhibition titled ACTIONS, which will see JR take over the two floors of the galleries flagship space on Rathbone Place. 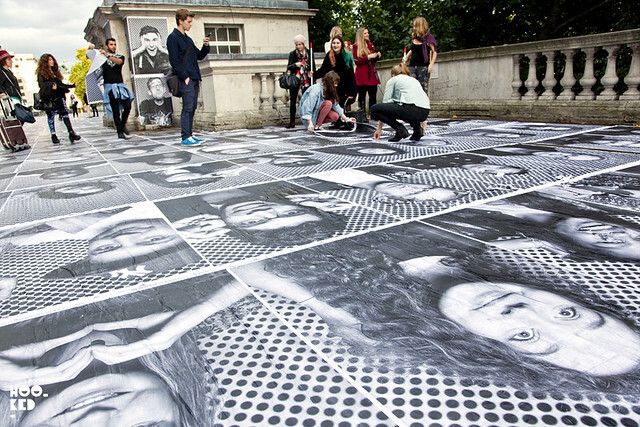 For the second part of the ACTIONS exhibition JR has brought his Inside Out Project to the city in the form of his mobile photo booth which invites members of the public to join in on this global art project by having a free black & white portrait of themselves taken, turning each participantʼs portrait and identity into communal artwork. 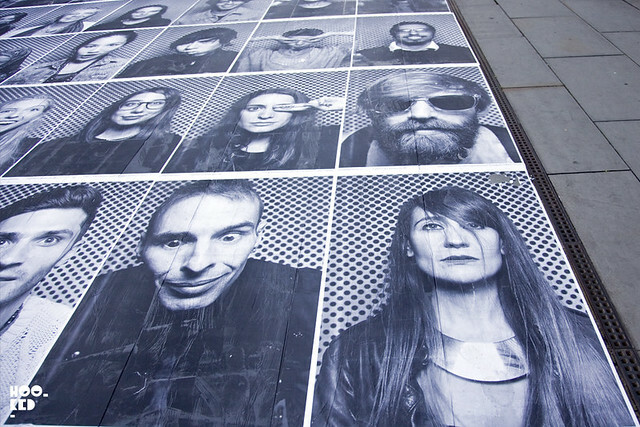 These large format portrait posters which are huge can be taken home should you chose but on our visit earlier this week most people partaking in the project were opting to have their portraits pasted with all the others outside Somerset House where the mobile van is stationed next to Waterloo Bridge. 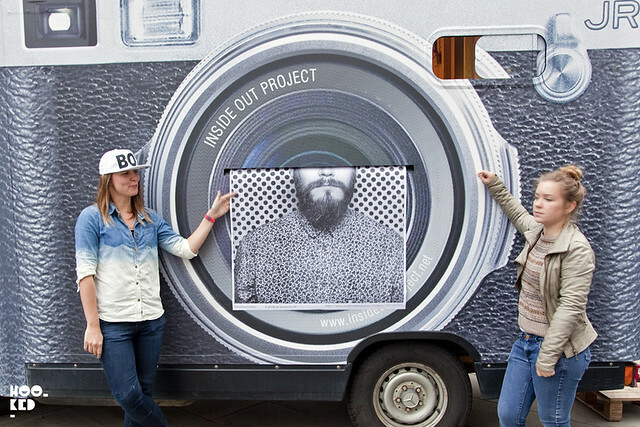 The Inside Out Project mobile van be in London until the the 11th October, open each day 1pm — 7pm and is not to be missed. 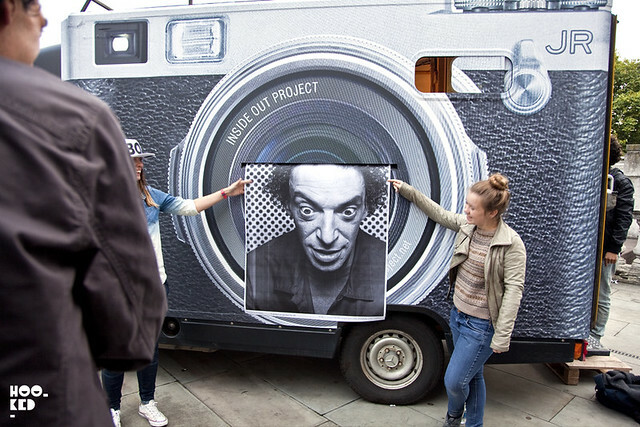 We had lots of fun taking part and were really impressed with the whole set-up and the team ensuring that our wait time was only 15 minutes before we were watching the giant camera like van spitting out our giant portrait to be pasted onto the ground along with the other 1213 London Portraits taken since October 3rd, 2013. Not only was the whole process really quick but the quality of the printed photos were pretty amazing considering they are printed on really lightweight paper. With only 3 days left in London we suggest you get down to van as soon as you can and be sure to visit the Actions exhibition at the gallery which opens to the public Friday 11th.